What a fantastic three bedroom detached family home! Tastefully decorated and improved throughout, this wonderful residence boasts good sized gardens to three aspects, off road parking and garage; along with uPVC double glazing and gas central heating system. Set in a much sought after and popular location not far from the local shops and amenities in Wallasey Village including Wallasey Grove Road train station, frequent bus routes and commuter links. Well placed for excellent local schooling especially St George’s Primary School and St Marys College. 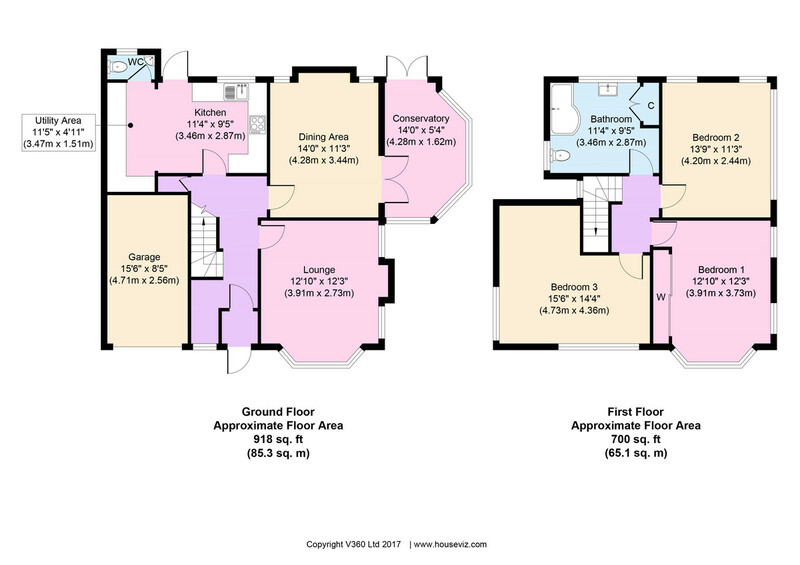 Interior: spacious hallway, living room, sitting room, conservatory, well planned breakfast kitchen and cloaks room on the ground floor. Off the first floor landing there are three good sized bedrooms and a beautiful family bathroom. Exterior: surrounding gardens including a spacious rear garden, off road parking and integral garage. Internal inspection is highly recommended for this excellent family abode; do not delay! ENTRANCE PORCH & HALLWAY Enter through part glazed composite main entrance door opens into a porch with tiled flooring. Internal glazed door into an inviting and spacious entrance hallway having lots of space for a study area and for kicking off those shoes. uPVC double glazed window to front elevation. Meter cupboard, central heating radiator and handy under stairs storage cupboard. Dark oak laminate flooring. Doors off to the ground floor accommodation. LIVING ROOM 14′ 08″ x 12′ 04″ (4.47m x 3.76m) uPVC double glazed bay window to front elevation with views to the Welsh hills across the roof tops. Two further uPVC double glazed windows to side elevation. Television point, central heating radiator and an open feature chimney breast. SITTING ROOM 14′ 0″ x 11′ 05″ (4.27m x 3.48m) A great place to relax in with an open plan feel into the conservatory. Two uPVC double glazed windows to rear elevation. Feature open fireplace with timber sleeper over. Dark oak laminate flooring that flows into the aforementioned conservatory. CONSERVATORY 13′ 04″ x 9′ 02″ (4.06m x 2.79m) Perfect for a dining table for those family meal times. uPVC double glazing to three sides and double opening uPVC double glazed doors into the garden. Inset ceiling spotlights and modern style vertical radiator. BREAKFAST KITCHEN 16′ 06″ x 12′ 02″ (5.03m x 3.71m) Well planned modern fitted kitchen with a matching range of base and wall units, wine rack and contrasting work surfaces over. Sink and drainer with mixer tap sitting under uPVC double glazed window overlooking the garden. Inset four ring ‘Bosch’ gas hob with oven and grill below and chimney style extractor above. Space and plumbing for dishwasher and washing machine. Additional space for fridge freezer. Half-moon shaped breakfast bar with central heating radiator below. Inset ceiling spotlights and Karndean flooring. Two Velux windows and uPVC double glazed door to rear garden. Door into downstairs WC. WC Handy addition to this family home is this downstairs cloaks room. uPVC double glazed frosted window to rear elevation. Low level WC and hand wash basin. LANDING Carpeted turned staircase with uPVC double glazed window on turn leading up to the first floor landing level. Doors off to the first floor accommodation. BEDROOM ONE 15′ 02″ x 12′ 06″ (4.62m x 3.81m) uPVC double glazed bay window to front elevation with great views across the rooftops to the Welsh hills and the sea. Two further uPVC double glazed windows to side elevation. Central heating radiator. BEDROOM TWO 13′ 11″ x 11′ 05″ (4.24m x 3.48m) uPVC double glazed window to side elevation with two further uPVC double glazed windows to rear elevation. Central heating radiator and freshly laid carpet. BEDROOM THREE 15′ 06″ x 14′ 04″ (4.72m x 4.37m) Once having been two rooms but now being made into one large L shaped bedroom. uPVC double glazed window to front elevation with great views, also there are two more uPVC double glazed windows, one to side and one to rear. Central heating radiator and freshly laid carpet. FAMILY BATHROOM 9′ 05″ x 7′ 11″ (2.87m x 2.41m) A beautiful family bathroom being tastefully decorated with uPVC double glazed frosted windows to both rear and side elevations. Suite comprising L shaped panel bath with shower and screen over, low level WC and pedestal wash basin. Fitted storage cupboards and loft access hatch. Inset ceiling spotlights, central heating radiator and contemporary tiled walls with tile effect flooring. EXTERIOR This wonderful home comes with some excellent outside space including raised front lawned gardens with mature shrubs and planters. Additionally at the front there is off road parking and an integral garage with up and over door, power and lighting. A pathway leads around to the side of the property where there is a paved patio area continuing into the spacious rear garden. The rear has plenty of established trees and shrubs creating a real private feel. A good sized lawned area, along with external power and lighting. There is also a raised decked patio ideal for garden furniture and of course the family BBQ. LOCATION Evesham Road can be found off Taunton Road which in turn is off Claremount Road, approx. 1.0 miles driving distance from our Liscard office.